he first “51” I ever saw sat in my father’s drawer since the days of my early childhood. I remember the glistening gold cap and its futuristic shape. It was not until after my college graduation that my father gave me his old “51” that had put him through medical school, along with a “21” and my grandmother’s Lady Duofold. Out of the three pens, the “51” always caught my attention, with its classic lines and elegant look. I often tried to fill it and write with it, but its mangled nib had seen better days. It was not until years later that I discovered vintage pens via the internet. Someone was advertising a restored “51” with a gold-filled cap and burgundy barrel. It was exactly like my father’s, or at least I thought so. When the pen arrived, I was surprised at how different it looked from my father’s. It had an obviously older looking clip with a blue diamond, and for the life of me, I could not unscrew that barrel to fill it!! All that I achieved was to unscrew the front to reveal this strange looking nib. After a few minutes, I discovered that the end of the barrel also unscrewed to reveal a little plastic plunger. How neat, I thought. When did they make this pen? What is it called? Over the next few months I discovered that this was a vacumatic filling “51” versus my father’s old Aerometric filling “51”. I had caught the pen-collecting bug. Months later, I saw a classified ad in an antiques newspaper, advertising old fountain pens for sale. I called, and it turned out that the guy selling the pens lived half-an-hour from my house. He faxed me a list of his collection, and I quickly made an appointment to look at a “Big Red”. When I arrived, the seller was ready with his large leather pouch, displaying a dizzying array of overlays and oversize pens. Out of the bunch, a “51” set glimmered with their shiny gold caps. I quickly said “Hey, that wasn’t on the list”. “Oh, I just picked it up at a garage sale”, he answered. I picked up the set to look at it, and immediately knew I had to have it. The caps were pristine, and it had a jewel at the end of the barrel, instead of the usual rounded ends I had seen. I noticed that the jewel on the cap was a shiny metal. “Is this normal?”, I asked in ignorance. “Oh yes, they are more desirable that way”, he answered. I walked out of his house a very happy man, not really knowing what I had bought, except that it was the best looking pen and pencil set I had ever seen. For the next few weeks I studied the set carefully. 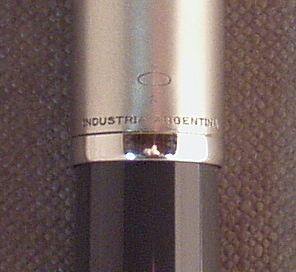 It had a metal filler instead of plastic, the Parker “51” imprint was on the blind cap and not the barrel, and most odd, the cap had a metal jewel, but the barrel jewel was pearl. I read all available books, but they provided little help except that aluminum jewels were a feature of the first year “51” pen. I posted questions on the internet, but the answers were discouraging, such as; “It is probably a mis-matched pen”; “I don’t think they made pencils in the first year”; “No one knows exactly what a first year “51” pen looks like”. Out of frustration and new found admiration for the “51”, I decided to concentrate my collecting endeavors on the “51”, and to find out as much as possible about it. This website is a compilation of my findings. It will hopefully help new collectors find out about the “51” in a fast, concise manner. Not too long ago, the Parker “51” was not really regarded as a vintage pen or collectible pen. Million of pens were made, and are still readily available, at very affordable prices. Parts for “51s” are plentiful. This has all started to change in the last few years. Parker “51s” are being rediscovered by those people that remember them from their youth, or have fond memories of their fathers or grandfathers writing with one. There is an enormous variety of “51s” to be collected, and within a short period of time, almost anyone can assemble a representative collection. There is a large number of common “51s” at affordable prices that make excellent user pens, often much cheaper than an equivalent modern pen. Only the rarest colors and cap patterns command high prices. For the collector, clean, unblemished caps are essential, and well worth the premium paid if you ever attempt to resell. Brushed stainless steel, or Lustraloy (Parker’s trademark name for this finish), are the most common caps, followed by gold filled caps, sterling silver caps and solid gold caps. Lustraloy caps are most often found in excellent shape because of the hardness of the metal. Gold filled caps, sterling caps and solid gold caps are often difficult to locate in pristine condition, and are usually found with dings or dents, which greatly diminishes their value. Versions with jewels at the end of the barrel, or blind cap, also known as double jewels (DJ), are rarer than the ones with a rounded blind cap. Double jewels are in high demand, with prices often two or three times that of a single jewel version. As user pens, the later aerometric filler holds an edge over the earlier vacumatic pens, mostly because they are almost always working, and need little or no repair, except for a good flush of the old dried up ink. The vacumatic filling mechanism almost always needs replacement of the rubber diaphragm, and can be hard to work on if you are not experienced with them. In reality, comparable common aerometric filling “51s” are usually more expensive than the vacumatic versions, mostly because of their reliability. Parker “51s” have a very strong market reputation, coupled with an unparalleled standard of quality. This will only help to drive up the prices of common and not so common “51s”. 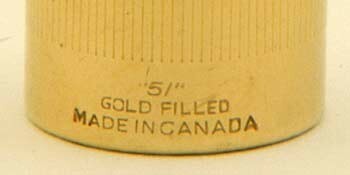 Parker “51s” were produced in several countries, and are usually marked with the country of origin. The highest production took place in the United States, with a substantial production also taking place in Canada, England and South America (mostly Brazil and Argentina).